Children enjoying a meal provided by the church. April is a time of new beginnings in Japan, with a new school year and the start of a new fiscal year. At Futsukaichi Eiko Christ Church, a new community outreach ministry began this April—Flowers of the Field Meal Service. With more families needing dual incomes these days, kids often don’t have family meal times. Throughout Japan there is a push for meal services to help provide kids with stable, nutritional meals. Our church has started the only meal service in our immediate community. We provide a low-cost, nutritious meal, two Friday evenings a month. The response has been surprising, with almost twenty coming each time so far. 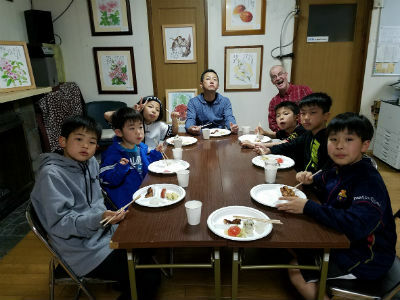 Please pray for our pastor’s wife, Kazuko Numa, as she leads this ministry and for church volunteer staff as we relate to our neighbors who join us for supper. We have also had six new kids and one new adult join our English conversation classes. The church is increasingly coming to be seen as a good place to be! In 1970, twenty-four-year-old former gymnast Tomihiro Hoshino was a P.E. teacher. While performing gymnastics for his junior high class, he broke his neck on a missed landing, resulting in quadriplegia. In 1972 he began writing and painting with his mouth, and in 1974 he accepted Jesus as his personal Savior after reading a Bible left by a friend. His story is truly one of amazing grace. Today Hoshino is known throughout Japan for his insightful, often humorous poetry and his water color paintings, mostly of flowers. A neighborhood couple came to the church for the first time for the Tomihiro Hoshino exhibition. Last summer, the gospel duet Olive (Tama Sei graduates Eiko Koyanagi and Aiko Higashi) released a new CD of songs based on Hoshino’s poetry. As a part of the recovery efforts for the 2016 Kumamoto earthquake, Olive scheduled an April-through-July tour of Hoshino’s paintings in northern Kyushu and seven concerts to take place at the end of July. We are local coordinators for this tour. Futsukaichi Church became the first stop for Hoshino’s exhibition in April and it will be seen at some twenty-some churches, mission schools, and temporary housing units leading up to the concerts. The original aim was to bring encouragement and hope to those who are still suffering, many homeless, after the April 2016 earthquake. But more than that has happened. 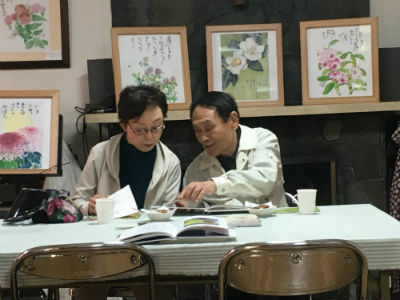 During the local exhibitions of Hoshino’s paintings, hundreds have been comforted, encouraged and challenged, and many have been introduced to neighborhood churches. Please pray for this tour as it continues into the summer. To learn more about Global Strategy missionaries to Japan, Bernie and Akiko Barton, and to discover ways to support their ministry, visit www.chogglobal.org/team/bbarton/ or call 800-848-2464. To follow their ministry on Facebook, visit https://www.facebook.com/BartonMinistryUpdates/. This entry was posted in All Church of God, Give Life, Global Strategy and tagged Akiko Barton, amazing grace, art, Bernie Barton, children, community, feeding, food, Fusukaichi Church, global hunger, Global Strategy, Hoshino, hunger, Japan, meals, Missionaries, missionary, missions, new beginnings, outreach, painting. Bookmark the permalink.